I just received my second push notification today from AP Mobile and I hope it will be the start of many more to come in other apps. 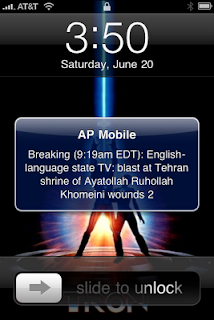 AP Mobile pushes breaking news stories to your sleep screen. It appears just like an SMS message The first one came on Thursday but it was for some forgettable news story so I dismissed that one as a test. Push notifications [video] allow the iPhone user to get alerts from your apps when you're not in the app. This is important because the iPhone does not allow you to be in more than one app at a time. The Palm Pre has distinguished itself from the iPhone by allowing its OS to be in multiple applications at the same time. However, early reviews show that the battery life of the Pre is not good. Using multiple applications compound the problem. That's exactly why Apple did not choose to go that route. Push notifications are not only good for breaking news, but will be used more for instant messaging applications. None of the IM apps right now take advantage of push, but soon they will. When they are enabled, you will be alerted when a new IM comes in. I hope developers find creative ways to use push notifications because I feel it will again change the way we use our iPhone. AppAdvice has a list of apps that use push notifications or will use push in a future update. I hope this list grows!